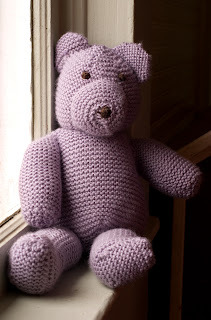 Last night I finished sewing together this knitted bear from Debbie Bliss's Simply Baby book. 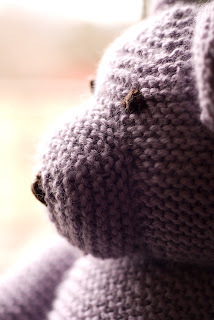 The sad fact is, I finished Clara's cardigan and felt compelled to start another knitting project before I had any new yarn, so he is a product of my compulsion crossed with my leftovers. Because generally, I don't make little animals, and the Composer was laughing at me! He's wonderfully squishy, and is currently taking turns sleeping around in children's beds. 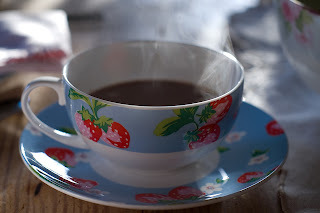 "There should be an atmosphere of cheerfulness and hospitality about the simplest places in which we eat . . . Sunlight and air should be considered in locating the dining room. If it is not placed where the sunshine reaches it much of the day, the color of the walls and hangings should suggest sunlight--yellow, for example. 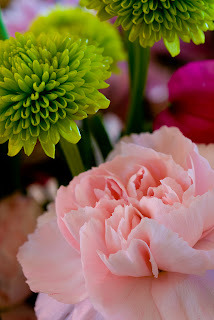 If the room is sunny, softer tones in grays or greens may be a wise choice." Everyone should have a reliable chicken soup they can turn to when kids get sick, the neighbors need food, or it snows. This easy soup is an excellent one to fall back on because the ingredients can be kept on hand for making anytime--while not literally "pantry" staples, all the ingredients are easily stored for longer-term keeping. After all, it's easy to make a great dinner when the fridge is full of fresh meat, delicious cheese, and favorite crispy vegetables--the challenge is making something pleasing when it's been eight or nine days since your last trip to the store. Saute til sweaty and onion is transparent. Transfer to a big stockpot. Bring to a boil, then turn down to a simmer and cover. When chicken is cooked through, turn off the flame and let cool slightly. Fish the chicken pieces out and shred or slice them. Taste the broth and maybe dress it up with the juice of half a lemon and a slug of tamari sauce. Bring the broth back to a boil, and dump in a large bag of egg noodles. When cooked, add the chicken back, and serve with lots of pepper. I made this yesterday and fed fifteen people! This recipe works for *you*. "Ready for Work in the Kitchen"
"The efficient worker includes getting ready for her job as part of her work. Handling food requires absolute cleanliness. Everyone who is to prepare food must, therefore, meet the exacting requirements of cleanliness. What one wears in the kitchen--inexpensive house dress, or smock, or apron--should be washable, attractive, and of course spick-and-span. Shoes should be comfortable and neat. Hair should be out of the way so that it will not be falling in the eyes or into the food. Such an arrangement can and should be becoming. Handkerchief should be placed safely in a pocket. Hands, especially the nails, should be thoroughly clean before handling food, and of course hands are never clean unless they have just been washed. A hand towel should be conveniently placed so that hands may be washed frequently. Never fail to wash your hands after using a handerchief, going to the toilet, or soiling the hands in any way. Mrs. Callard is the winner of the hotpad giveaway! Congratulations! If you'll leave your e-mail I'll e-mail you and then delete your address from the comments. Don't forget, Lacey, a package is going out for you too. Okay, ladies, this is really simple! Just cutting, pinning, and straight-line sewing. There are probably *better* ways to sew up a hotpad, but this has got to be the easiest. 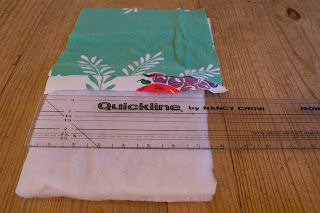 Now, cut out your fabric squares, about 10 inches square. Then cut out batting about 1 1/2 inchessmaller on each side (maybe 8 1/2" square) . I used two layers of batting and simply cut a rectangle and folded it over double. Now just sandwich your layers together. 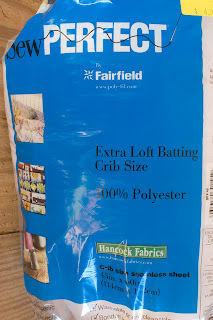 You're hoping that your fabric edges come out just a smidgen farther than the batting. If the batting's sticking out, just poke it in--it doesn't matter if it bunches up a little bit. Pin everything together securely. Maybe your corners will match up better than mine! I always end up tweaking mine right as they are going under the needle. 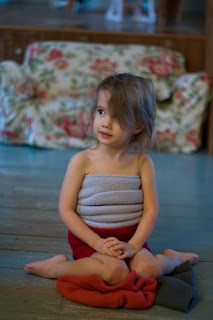 In sewing, whatever works is fine, and a hotpad is no place for perfectionism! Stich all the way around the four sides, as close to the edge as possible without going off. Now get brave and zip the hotpad through again a few times in some random lines--maybe a smaller concentric square, or an X, or three diagonals. The only thing I would caution you about is making more than two lines meet at any given point--the batting gets too compressed to give you good protection from a hot pan. 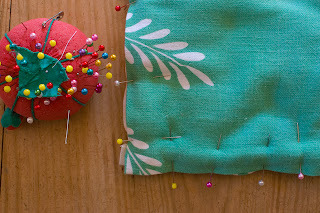 Feel free to work an asymmetrical pattern--that's part of the "homespun charm" you're going for. You may find that the top layer wants to bunch up a tiny bit as you run the hotpad through, making a tiny "bump" or gather as you meet up with a stitching line. My attitude is, who cares? Because it's a really cute hotpad and it's going to get used and stained, and a little bump is no big deal! 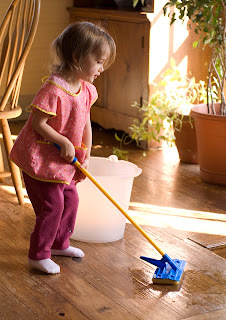 For the last several years I loved using a squirt of Method Floor Cleaner in my mop bucket; I alternated between bottles of lavender and lemon-ginger. But I haven't seen it at Target in months, and out of necessity have come up with something I love far more. In my mop bucket I do a tiny dab of dishwashing liquid, then three or four drops of peppermint essential oil. Cleaning heaven. 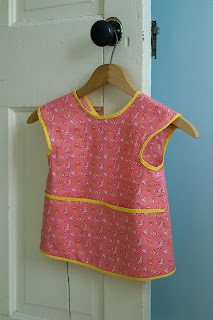 I've used this pattern before to make aprons for my big girls, but got the itch to make a tiny bright smock for Daisy on Saturday morning and pulled it out again. I had some very retro-looking silky pink cotton (what a pink! 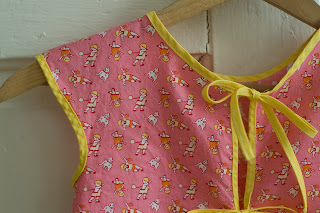 shades of strawberry and mango), and bright yellow binding--great combination. It's precious. She wore it to church Sunday over her pretty dress and has scarcely taken it off since then. The pocket is large, and perfect for holding tiny babies, socks, yarn, and snacks. 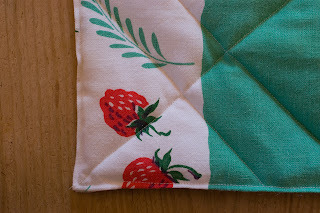 For years I have loved a green and red vintage tablecloth. In its heyday it actually went on the table. Then it went out on yard picnics with the girls. After sustaining a few poorly-mended tears it became Albert's night cloth and covered his birdcage in style. Recently though it gave out badly and came apart in the center. But the margins! They were still good! 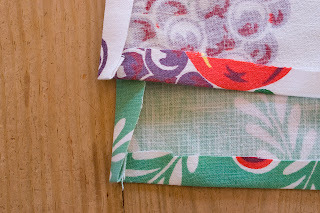 I got carried away cutting the good parts up into squares for a big batch of hotpads. It's a beautiful stack, but it's more than I need. 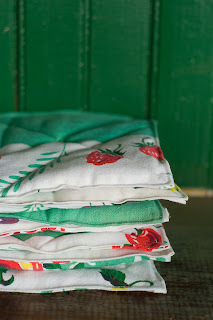 So I've decided to celebrate the abundant Hotpad Harvest with a giveaway--I'll send out a little package with a hotpad, a delicious 1940's vintage housedress pattern, and some other goodies. If you're interested, say so in a comment. On Friday I'll pick a name out of a hat, and a little bit of the Schoolhouse will go out in the mail! 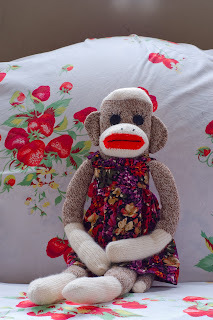 Clara sewed her sock monkey a new dress on her new sewing machine. I'd say her sock monkey looks pleased! This morning I intended to make a big batch of cinnamon rolls to carry over to friends who are painting their new house, but the morning got away from me (thanks a lot, cozy fire!). So instead of doing a yeast dough I quickly put together something I'd never made before. And I will be making them again! I simply took a double batch of biscuit dough and rolled it into a large flat rectangle, spread it with softened butter, sprinkled it heavily with brown sugar and cinnamon, before rolling it up into a log and slicing it in half-inch slices (just like cinnamon rolls) to bake in a greased pan. The whole process took less than half an hour, and they were perfect for a cold wet work day. over mixture. With hands or rubber spatula, gently mix until it holds together as a dough. I never roll mine out, just grab off chunks and roughly shape into biscuit shapes by hand. Lay on an ungreased cookie sheet and bake at 450 for about 10 minutes. Details of pillows from around the house . 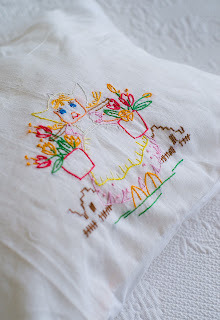 . .
A couple of months ago I took vintage hankies in various pinks and appliqued them to plain white linen pillowcases I made to cover square throw pillows. 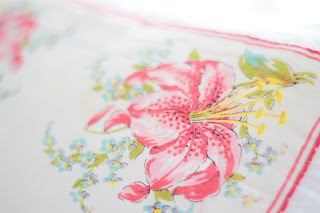 This hankie was a gift from Clara--she knew I would *love* the pink tiger lily. These pillows live on my bed . 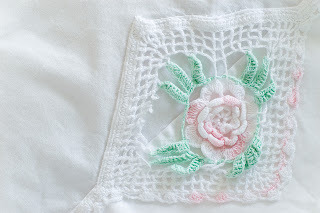 . .
A hand-crocheted applique on a pillowcase I often use. It looks as though it is reaching the end of its lifespan, but a stray hole never bothers me. 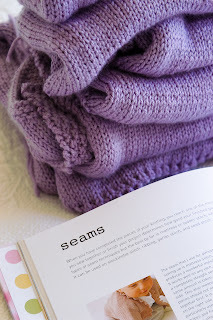 I would love to make a set of pillowcases with this kind of detail--hey, maybe from my "Television Scarfs" book! 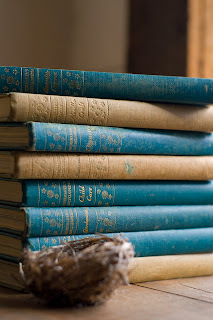 I have had the urge to go to the thrift shops this week and have had such fun! 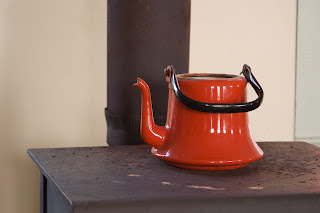 My sights are set very low, so I'm thrilled by even a tiny find; on the other hand, my standards are pretty high and I don't want to bring home anything that's not going to be truly useful, beautiful, and at home. 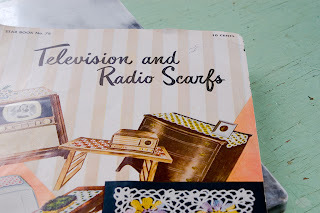 •Most Importantly, this book of patterns for "Television and Radio Scarfs"! How did I make it this long without a crocheted radio scarf? I do just about the same things every day, and I love that kind of life. I cook breakfast (see the lovely dishes that were my Christmas gift from the Composer! 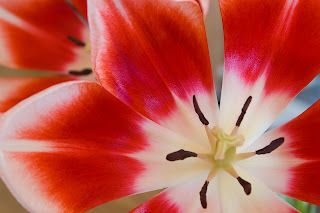 ), I clean my house, I teach my children, I make a few work phone calls, rearrange tabletops, knit a little, cut out a flannel nightgown, cook dinner, think about menus, put on and take off my apron a hundred times, read to Daisy, go for a walk. That's a nice life. I love that life! More sewing! 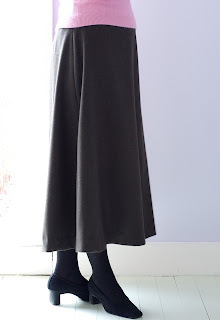 My inspiration for this skirt was the bustle-back skirts of the late 1940's. I took a plain side-zipping, A-line skirt pattern and cut it out one size larger than I needed. Then I cut out a waistband to fit my waist exactly. When I pinned the skirt pieces to the waistband, I brought all the extra fabric around to the center back, and folded it into a box pleat. I like to think that it lends a gracefully-draping fullness to the back of the skirt, while keeping the front nice and fitted. For fabric I used a gorgeous length of wool flannel that I bought on my first trip ever to Denver Fabrics--it only took me a year and half to work up the courage to cut into it! 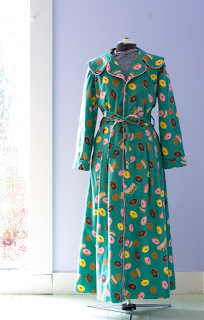 Carol K. graciously lent me this fabulous housecoat pattern. I knew I would sew it up in the big, big collar version because how often do you get to do that? Not often enough. And boy, did I luck out at the fabric store!! 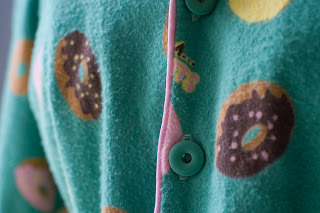 Who knew I'd find flannel in that great fifties aqua color, printed with DOUGHNUTS!! And imagine my surprise when I found FIFTEEN matching vintage buttons in my stash. Shaped. Like. Doughnuts. So, although this housecoat makes me look like Mrs. Jetson (according to the Composer), I know it was meant to be. 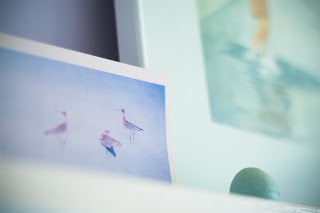 A Japanese postcard, a watercolor painting, a robin's egg soap . . .
Daisy and I are ladies of leisure no more--everyone's home and we hit the ground running. First order of business: the enormous pile of laundry including all the ski wear. Daisy enjoyed decking herself out in several different configurations of neck gaiters. Skirts, bras--they can be anything! It was also orchestra morning which meant a trip to the city--and the yarn store, where I purchased eight skeins of Debbie Bliss pale pink Cashmerino Aran for my next knitting project, Bella's Bolero. We had a sweet peaceful week, with lots of sewing, sorting, and sallying forth, but it is much nicer to have everyone home safely! 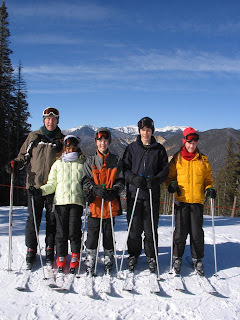 Grandpa, Bella, Felix, Giles, and Clara having a happy skiing time--they're driving home today! "Oh, yes . . . and you're a stage manager, too! You set the mood for a child, alternating gay activity with periods of calm. You help a child get to sleep by providing a restful atmosphere, cool air, drawn blinds, and maybe soft music. You see that mealtimes are pleasant and serene with the emphasis on sociability, not manners or punishment. You arrange a child's playroom so he has several different type things to do, seeing that it's bright and sunny and generally appealing. And you change scenes, too. You sense the moment when your child is becoming bored with indoor amusements . . . And then you lose no time is getting him outside for play. And you sense approaching fatigue in time to remove him indoors again . . ."
"Made Up of Little Things"
"Most people's lives are made up of little things. On the whole, in spite of battle, murder, and sudden death, most of us are concerned, day in and day out, with work and play, food and rest; and one day is pretty much like another. If this is an accurate picture of your life, and you are looking forward eagerly to more of the same, you're contented. You're also either lucky or very wise--or both, and probably blessed with good health." This vintage advice for guests is so true, and clearly has been taken to heart by my most faithful houseguest, the lovely Elyse, who came for a week after Christmas. I have such fond memories of cooking together with her here, and I know to lay in lots of garlic before she comes, because she *will* need it. She has also been known to fold mountains of clothes and replace broken toilet seats. "If you stay longer than overnight in a servantless house, you should arrive at a firm understanding with your hostess about doing your fair share of the domestic chores. Don't volunteer for these tasks in a half-hearted way but consider them as an obligation. You should help with the dishes and make your own bed and your husband's. If your hostess insists on performing these tasks herself, find other ways of helping, such as driving the car, looking after the children, or working in the garden [or, I would add, mincing garlic]. Anyone who is particularly good at cooking certain dishes or making small household repairs should offer to exercise his or her talent. The longer you stay, the more useful you should try to be." Not surprisingly, there are all kinds of goodies in my new encyclopedias. I'm enjoying the book on decorating, which takes us room by room through various styles of homes: "shabby apartments", "old four-room apartments", "apartments for career girls", and my favorite so far, the (modernized) "wonderful old country home". 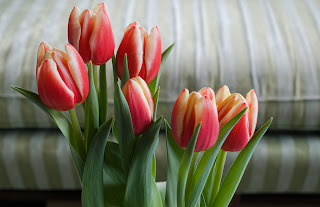 "The living room is colorful and cozy. It is the kind of a room where friends love to bring their mending and spend an afternoon sewing and visiting around the generous tea table. There is everything a man needs to work comfortably at this slant-top desk." I finished today! Zipper sewn in, drawstring knitted and threaded through a casing, and all the buttons sewn on! I am glad to have it finished before everyone leaves for skiing--it looks so comfy for a road trip in cold weather. 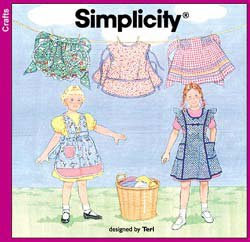 Next, a pale pink shrug for Bella, but not this week . . .
See the little nest on the table in the photo? That's because I'll be doing a lot of sitting at home reading next week, after Daisy and I pack everyone else off on a ski trip. 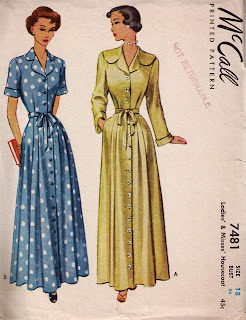 We're going to organize the closets, take my grandmother out for lunch, and spend the rest of the time in 1952. The Composer's not the only one around here making movies--Felix completed his first tiny feature. Three minutes of Lego man vs. Lego dinosaur, complete with pirated score and real editing done on the Composer's software. Don't you love the set? Especially the rolling hill in the background made from an afghan. •Beg, steal, or buy a couple of large pots if you don't own any. A large, heavy-duty canner is the biggest thing I have, and nicely holds chili for twenty. •This is not the time to try out new recipes--stick with old favorites you know will work. •It is possible to selectively reduce specific ingredients like chopped onions--four can stretch to five if you just can't take chopping any more. •On a related note, don't think that just because the pot is big, big sloppy pieces of onion will be just fine. •Check out some once-a-month cooking recipes--they already give ingredients in bulk, tend to be stable dishes (rather than fussy, fiddly last-minute affairs), and often offer helpful advice about timing your cooking, planning your steps, etc. •Good luck, and wish me the same! 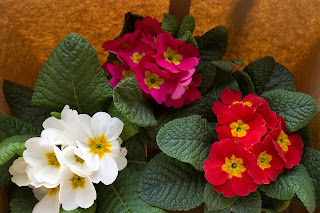 Primroses were cheap and cheery at the grocery store this morning when I made a quick run with Daisy. When I checked out, the bag boy ripped the top half off a paper bag and set the flowers in it, and I was charmed by the juxtaposition of the bright colors, succulent leaves, and rough brown paper. Clara's sweater is ready to be sewn together. I've never sewn any seams before and am greatly looking forward to turning this stack of flat pieces into a shaped garment. 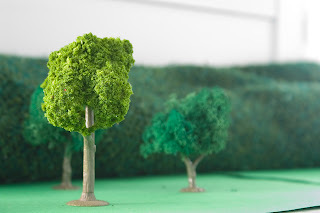 My favorite part of any project is mastering something new, as long as it's not too hard! Note the luscious Debbie Bliss Simply Baby book demonstrating seaming techniques: Christmas present!